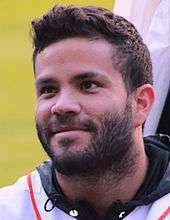 José Carlos Altuve (Spanish pronunciation: [alˈtuβe]; born May 6, 1990) is a Venezuelan professional baseball second baseman for the Houston Astros of Major League Baseball (MLB). 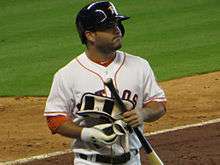 Altuve made his major league debut in July 2011. As of 2014, he is the shortest active MLB player at 5 feet 6 inches (1.68 m). Altuve has been selected to four All-Star Games, making his first All-Star Game start in 2015. In 2014, he became the first player in over 80 years to reach 130 hits and 40 stolen bases before the All-Star Game. That same season he became the first Astro to win the batting title after hitting .341. Altuve attended a tryout at the Houston Astros' facility in Venezuela. He was cut as the Astros felt he was too short. With the encouragement of his father, Altuve returned to the next tryout session, and was eventually given an evaluation. The Astros signed Altuve before the 2007 season as an undrafted free agent for a $15,000 signing bonus. After a strong 2007 season in the Venezuelan Summer League in which he hit .343, he came to the United States in 2008 and hit .284 in 40 games for the Greeneville Astros in the Rookie-level Appalachian League. He returned to Greeneville in '09 and hit .324 with 21 steals in just 45 games, earning him a spot on the league all-star team, team MVP honors, and a promotion to the Tri-City ValleyCats of the Class A-Short Season New York-Penn League for which he played in 21 games. He began 2010 with the Lexington Legends of the Class A South Atlantic League, hitting .308 with 39 steals and 11 home runs and earning a spot on the league all-star team, then moved up to the Lancaster JetHawks in the Class A-Advanced California League and hit .276. Returning to Lancaster for 2011, he hit .408 with 19 steals in 52 games. After being promoted to the Corpus Christi Hooks of the Class AA Texas League, he hit .361, giving him an overall line of .389 with 24 steals, 26 walks, and 40 strikeouts in 357 minor league at-bats that year. He was named the second baseman on Baseball America's 2011 Minor League All Star Team as well as the Houston Astros Minor League Player of the Year. Altuve was called up to the major league club in mid-summer, bypassing Class AAA level. The Astros promoted Altuve to the majors for the first time on July 19, 2011. He represented the Astros at the 2011 All-Star Futures Game. He was named the second baseman on Baseball America's 2011 Minor League All Star team. On July 27, 2011, Altuve tied Russ Johnson for the Astros record for most consecutive games with a hit to start a career with 7. On August 20, 2011, Altuve hit an inside-the-park home run, his first major league home-run. He became the first Astros player since Adam Everett in 2003 to hit an inside-the-park home run, the first Astros player to get his first major league home run on an inside-the-park home run since pitcher Butch Henry in 1992, and the first Astros player to lead off a game with an inside-the-park home run since Bill Doran in 1987. He batted .346 over his first 21 games before slumping a bit and ended the year with a .276 average. He also hit two home runs, stole seven bases and posted a .358 slugging percentage in 221 at-bats. Altuve returned to Venezuela to play for Navegantes del Magallanes in the Venezuelan Winter League, hitting .339 with a .381 on-base percentage and a .455 slugging percentage. 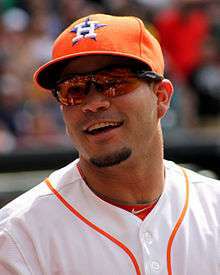 Altuve finished 2011 with 898 plate appearances (391 in the minors, 234 in the majors, and 273 in Venezuela). Altuve had 82 hits in winter league, bringing his cumulative year-end count to 282. On May 1, Altuve faced New York Mets reliever Jon Rauch, who at 6 feet 11 inches (2.11 m) is the tallest player in major league history. The 18-inch (460 mm) height differential is believed to be the biggest between pitcher and batter with exception of a 1951 publicity stunt in which a 3-foot-7-inch (1.09 m) Eddie Gaedel had one at-bat for the St. Louis Browns. Altuve was the Astros' representative at the 2012 MLB All Star Game. On July 13, 2013, Altuve signed a four-year, $12.5 million extension that includes two club options for 2018 and 2019 worth $6 and $6.5 million respectively. The deal also included a $750,000 bonus to be received in 2013. At the time of the extension, Altuve was hitting .280 with 21 SB, 15 2B and 28 RBI. On June 29, 2014, Altuve stole two bases in a game against the Detroit Tigers. This made him the first MLB player since Ray Chapman in 1917 to steal two or more bases in four consecutive games. In 2014, Altuve became the first MLB player since 1933 to have 130 hits and 40 stolen bases before the All-Star Break. Altuve was named an All-Star in 2014. Coupled with his 2012 All-Star nod in the Astros' final season as a National League team, Altuve is the only player in Major League history to represent both the American and National Leagues in the All-Star Game while still being a member of the same team. On September 16, Altuve hit a single up the middle to break Craig Biggio's franchise single season hit record of 210 hits. The Astros had 11 games remaining in the season at the time that Altuve broke the record. In 158 games, Altuve had 225 hits and a .341 batting average, both of which led the major leagues. His 56 stolen bases led the American League. He also had 47 doubles, 7 home runs, and 59 RBI. He became the first Astros player to win a batting title. After the 2014 season, Altuve traveled to Japan to participate in the 2014 Major League Baseball Japan All-Star Series. He was named the GIBBY/This Year in Baseball Award winner as the Breakout Everyday Player of the Year. Altuve was voted as the AL's starting second baseman for the 2015 MLB All-Star Game. On September 11, 2015, Altuve hit his 800th career hit, surpassing Craig Biggio for the fastest Astro player to reach 800 hits. In the final game of the season, Altuve went 3 for 5 to hit the 200 hit mark for the second season in a row, becoming the first player in Astros history to achieve two 200 hit seasons in a row. This also makes Altuve the first player from Venezuela with multiple 200 hits seasons. Altuve finished the season with a .313 batting average, third best in the majors, and 15 HRs, a career high. He finished leading the American League in stolen bases for the second consecutive year. He also led the American league in fielding percentage (.993) for second base. With the Astros entering the American League wild card, Altuve went to the playoffs for the first time in his career. Altuve was awarded his first career Gold Glove Award for second base on November 10. He also received his second consecutive Silver Slugger Award. In 2016, Altuve was an All-Star selection for the fourth time of his career, and second consecutive start. In 161 games, Altuve had an MLB-leading 216 hits, an AL-leading .338 batting average, 30 stolen bases. He also found a power surge with a career high 42 doubles, 24 home runs, and 96 RBI. This marked his second batting title, the last being in 2014. At the end of the season, he was named The Sporting News Player of the Year, and the MLBPA Players Choice Awards for Major League Player of the Year, AL Most Outstanding Player, and Majestic Always Game Award. Originally listed at 5 feet 7 inches (1.70 m), Altuve is now listed at his correct height of 5 feet 6 inches (1.68 m), making him the shortest active player in Major League Baseball, and the shortest since Freddie Patek retired following the 1981 season. Inspired by broadcasters debating how many "Altuves" a particular home run traveled, Bryan Trostel created a simple web-based calculator to calculate distance in Official Standard Listed Altuves (OSLA). To match Altuve's listed height, one OSLA = 5.417 feet. Altuve himself has been receptive of the idea, saying "It's funny, man... When they told me how many 'Altuves' was a home run, I just laughed." Trostel, who published his calculator at How Many Altuves, has expanded it to include speed (Altuves per second) as well as cubic and squared Altuves for volume and area. On Nov. 1, 2016, Altuve and his wife Nina welcomed their first child, a girl named Melanie Andrea. ↑ Span, Emma. "Little big league: How Jose Altuve became an unlikely batting champ". Sports Illustrated. Retrieved August 26, 2015. ↑ Kepner, Tyler (August 19, 2014). "Outsize Production: Astros' Jose Altuve Doesn't Let Height Be a Disadvantage". The New York Times. Retrieved August 21, 2014. ↑ "Jose Altuve before he was JOSE ALTUVE". Ultimate Astros. Retrieved October 4, 2014. ↑ "Astros call up 5-foot-7 second baseman Jose Altuve". Retrieved October 4, 2014. ↑ "Altuve tabbed for World team at Futures Game". Houston Astros. Retrieved October 4, 2014. ↑ J.J. Cooper and Matt Eddy (September 16, 2011). "2011 Minor League All-Star Team". Baseball America. Retrieved October 2, 2011. ↑ "Fascinating Facts from July 27, 2011's games". Houston Astros. Retrieved October 4, 2014. ↑ "Altuve notches inside-the-park homer". Houston Astros. Retrieved October 4, 2014. ↑ ""Jose Altuve and the marathon season(s)" HoustonChronicle.com 1/5/12". Ultimate Astros. Retrieved October 4, 2014. ↑ ""Jon Rauch pitches to Jose Altuve in baseball's version of David vs. Goliath" Yahoo Sports 5/2/2012". Yahoo Sports. May 2, 2012. Retrieved October 4, 2014. ↑ "Altuve thrilled to be Astros' All-Star". CBS Sports. July 2, 2012. Retrieved June 22, 2016. ↑ Rosenthal, Ken (July 13, 2013). "Astros, 2B Altuve agree to extension". FOX Sports. ↑ "Astros 6, Tigers 4". CBS Sports. June 29, 2014. Retrieved July 1, 2014. ↑ Ortiz, Jose de Jesus. "Altuve sets MLB record for hits, stolen bases mark before break". Houston Chronicle. Retrieved July 13, 2014. ↑ "Astros' Altuve leaves his mark on All-Star Game". Ultimate Astros. Retrieved October 4, 2014. ↑ AP (September 17, 2014). "Jose Altuve breaks Biggio's record in Astros' loss". Retrieved October 4, 2014. ↑ "Jose Altuve's two hits seal batting title as Astros drop season finale". Ultimate Astros. Retrieved October 4, 2014. ↑ Wagner, James (September 30, 2014). "Bryce Harper to play for MLB all-star team in Japan in November". Washington Post. Retrieved October 4, 2014. 1 2 Footer, Alyson (April 14, 2015). "Altuve receives GIBBY Award in pregame ceremony: Astros second baseman named 2014 Breakout Everyday Player of the Year". MLB.com. Retrieved November 12, 2016. ↑ "Jose Altuve passes Omar Infante on final tally to earn All-Star nod". Ultimate Astros. Retrieved August 26, 2015. ↑ "Astro Jose Altuve fastest to reach 800th hit". MLB.com. Retrieved November 14, 2015. ↑ "Dallas Keuchel, Jose Altuve take home Gold Gloves". Climbing Tal's Hill. Retrieved November 11, 2015. 1 2 Spector, Jesse (October 27, 2016). "Jose Altuve voted Sporting News MLB Player of the Year for 2016". The Sporting News. Retrieved October 27, 2016. 1 2 3 4 Kaplan, Jake (November 9, 2016). "Jose Altuve earns 3 accolades at MLBPA's Players Choice Awards". Houston Chronicle. Retrieved November 11, 2016. ↑ "Astros' Altuve stands shorter than all active MLB players". Ultimate Astros. Retrieved June 1, 2015. ↑ "Astros' 5-5 Jose Altuve not short on talent". USATODAY.COM. Retrieved June 1, 2015. ↑ Diminutive-Altuve drawing fans attention. Fox Sports. Retrieved on on October 28, 2016. Wikimedia Commons has media related to José Altuve.